Seems like I’m not around a lot these days but I have been reading and will be popping up some bookish posts soon. However, I’ve been on holiday (Munich and Paris), my parents, family and friends are in town, one of my friends has popped out a new baby and I have a wedding to attend this week. Phew. That’s a lot of my social time accounted for. So where do I fit in my blogging? Well, while I watch telly, of course. Which reminds me that when I was in Paris, we were lucky enough to stay in a lovely little hotel which had JSTV (Japanese Satellite tv)! OMG, we watched Gegege no Nyobo, a daily tv drama about the wife of the mangaka Shigeru Mizuki who created Gegege no Kitaro (a supernatural manga about Japanese ghosts and monsters) and also an unexpected episode of Yatter-man. 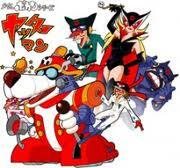 I loved Yatter-man as a child but haven’t thought about the cartoon in over 25 years. I must have watched it when I was tiny and it was sweet to watch it again. But I’m not here today because I’m Slightly Peckish again. August is lazy month and I can’t be bothered to even make breakfast. So what do I do? I go and get me some Saaf Indian grub. Check it! I finished reading Beside the Sea today and it is such a thought provoking novella. It left me quite stunned. I am not at all sure how I am going to review it. I hope you enjoyed your time in Paris and Munich, but it sounds like you did! I just finished it too and need a few days for it to sink in properly. And ‘stunned’ is the right word for it. Looking forward to hearing your thoughts. august IS a lazy month for me too. i take it so easy, i am starting to think i might not recover even when fall and winter come : ) but because i don’t do much of things i thought i ought to do, i ve found myself with more time for reading! and i now have a pretty sure feeling that i ve got my priorities right after all! winstonsdad: I just finished it last night and can’t stop thinking about it. Will be checking out your post on it. itoeri: I’m finding it difficult to juggle my reading and writing time with other fun stuff. It would be nice to re-arrange priorities but I want to do it all! Mystica: Thanks. Looking forward to seeing what you bought! « New books, mais oui!